A new University of Florida study dismisses claims that Megalodon is still alive by determining a date of extinction for the largest predatory shark to ever live. The ancient megalodon, it is now believed grew up to 50 feet in length and sported teeth as long as 7 inches. And now scientists have their firmest timeframe yet for when the creature went extinct. Scientists at the University of Florida in Gainesville report this week in a journal that the feared shark died out 2.6 million years ago. The study may also one day help scientists better understand the potential widespread effects of losing the planet’s top predators, said lead author Catalina Pimiento. The study represents the first phase of Pimiento’s ongoing reconstruction of megalodon’s extinction. As modern top predators, especially large sharks, are significantly declining worldwide due to the current biodiversity crisis, Pimiento said this study serves as the basis to better understand the consequences of these changes. Pimiento plans to further investigate possible correlations between changes in megalodon’s distribution and the evolutionary trends of marine mammals, such as whales and other sharks. The slowly unraveling details of megalodon’s extinction and various aspects of its natural history have consumed Pimiento’s research for the past six years, including ongoing analysis of megalodon’s body size and a 2010 PLOS ONE study that proposed Panama served as a nursery habitat for the species. For the new study, researchers used databases and scientific literature of the most recent megalodon records and calculated the extinction using a novel mathematical model proven reliable in recent experimental testing by study co-author Christopher F. Clements with the Institute of Evolutionary Biology and Environmental Studies at the University of Zurich. 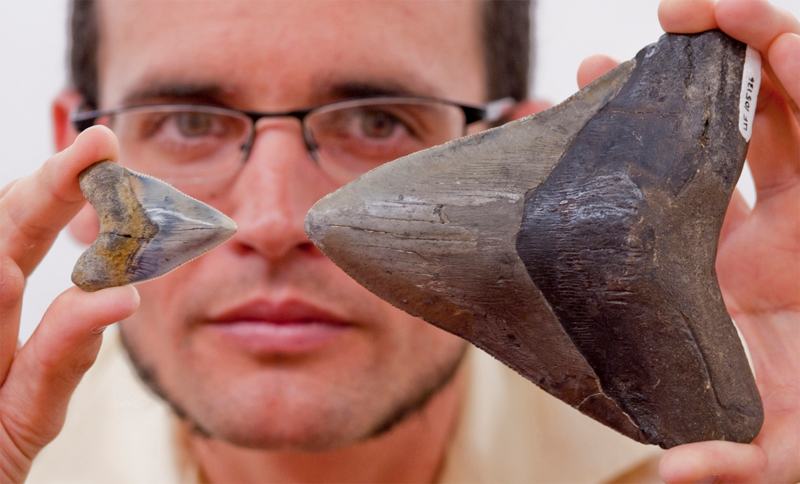 Vertebrate paleontologist Jorge Velez-Juarbe with the Natural History Museum of Los Angeles County said the study will not only serve as a key reference for debunking the myth that megalodon still exists, but its novel methods will influence the future of scientific research of extinct animals and plants.